Reader's Digest (no, you don't have to be "old" to read it) has a feature they refer to as "4 Ways of Looking at..." where they highlight an object from 4 different perspectives. Last month it was "4 Ways of Looking at a mask." They've been doing this for awhile now and in the past have featured such exciting subject matter as a bubble, a wall, a chair and my personal favorite... an egg. Yee-haw! 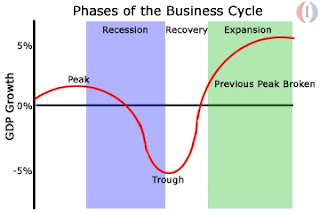 You probably don't ever think of it this way, but most businesses these last few years have been operating in what is known as "a trough"... my own employer included, hence the whole, "I'm looking for a new job" drama around here. Some people see this as a good place to be because it means they've reached the bottom and can only do better from here. Those people poop rainbows and are probably already independently wealthy anyway. One of my least favorite things to do is to saddle up shoulder-to-shoulder with a bunch of guys at a stadium urinal trough, because inevitably, the drunk guy next to you is forcing 100 psi of used beer against the back wall and bouncing it back onto your pants. Therefore, I always try to stand next to an old guy, because they usually don't have enough horsepower to create a backsplash. Taken from one of the most classic movies of all time, Monty Python and the Holy Grail, this scene never fails to deliver. I don't want to talk to you no more, you empty headed animal food trough wiper! I fart in your general direction! You mother was a hamster and your father smelt of elderberries. Tomorrow night my entire family is going out to eat at one of our favorite places, The Old Country Buffet - courtesy of my mom, dad and brother (thanks folks!). We jokingly call it "the trough," because we always eat like pigs every time we go there. nom nom... more of everything! The urinal problem? Honestly, (to quote Elaine Benes from Seinfeld) I don't know how you guys walk around with those things. I used to love reading Reader's Digest...back when I was younger. That's the fourth time Python has been mentioned around me in the past week. I'm gonna have to have some Holy Grail very soon! I saw how fast food disappears at your dinner table. I would wager The Country Buffet did not make a profit off the Lee family. Is the last caption from when Elaine was stuck in the back of the plane, and Jerry was flying first class with the hot blonde model? kathy - I think the same could be said for you women, but I'd rather not have this discussion if you don't mind. leeuna - True, it would be very difficult for you to use a urinal. Although I've heard it's been done. ed - Yeah, that's because it's their 40th anniversary right now. They're all over the place these days! rick - Yes! Good catch. I believe the flight attendant asked him if he would like anything else, and because he was flying in first class, his reply was "More of everything!" One of my favorite lines from Python. And Olde Country Buffet, oink, oink. Especially the "fart in your general direction" bit. 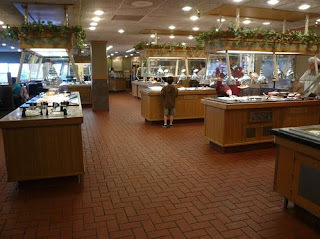 Mom loves Old Country Buffet but Dad and I tend to shy away from it because too many kids go up unsupervised and put their hands on stuff and make a mess. 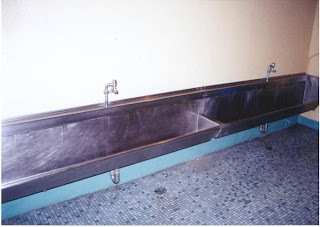 I've never peed in a trough (thank goodness), but I feel really bad for the person who has to clean it. If I ever poop rainbows, I'm taking a picture of it and posting it on the Internet for everyone to see. Just don't mix up the troughs. If you pee into those serving trays at Old Country Buffet, the backsplash is legendary. Thank the gods I am a woman. I could never pee "in public".